I started the month by attending the Maelstrom convention in NJ. It is an interesting format for a convention. Most of the Double Exposure-run conventions are completely scheduled, with no official open gaming space. This convention was a counter to that, with no non-panel events scheduled. However, it wasn't the complete disorganization of a pure open gaming room. The idea is that there is a central dispatch room with stations. When someone wanted to run a game, he or she would put up a sign at that station. People looking for a game during that slot come to the dispatch room and choose from the half-dozen or so games currently on offer. When enough people gather at a single station, that game begins. I definitely prefer this format versus the normal open-gaming room. You don't have to wander aimlessly around tables trying to figure out what games people are playing and hoping to find an open one. It also has the notion of general starting slots, which increases the number of choices available at the same time that you are looking for a game. In pure open-gaming, there might only be two or three open games at any given time. It increases the pressure on you to join a game you aren't wild about because you have no idea when a better option might be available. I also like this format over the completely scheduled convention. I have knowing that I won't be able to play a game at all because it is only being run once while I am running something else. I also don't have to worry about signing up for a game then not being in the mood for it when the event starts. I can just choose whatever I feel like right when I'm ready to play. In my ideal convention, tournament games would be scheduled and everything else would be run on this open dispatch system. The downside to this system is that for it to work, there needs to be a critical mass of people such that at any given time there are at least 50 people looking for a game. I have no idea what the official attendance was, but I feel like we had about 70% of what was needed. That's most likely a combination of this being the first year for this convention combined with people being unclear long beforehand of what exactly would happen. I didn't understand myself until days before the event. I imagine next year the attendance will reach critical mass and this will be a real success. Though, as I said before, I'd love it if they applied this format to non-tournament sessions at DexCon and Dreamation. Prior to the convention I had a test of Subprime which proved to me that the central idea was fundamentally flawed and that the whole design needed to be abandoned. As a result, I only brought FCOJ to test this time. The test let me try out an idea for dealing with the need for a fun thing for Industrialists to do without making the board to confusing to read. The economy ended up unbalanced, but the new mechanic worked well enough to just need tweaking. I was also convinced to shorten each round to continue to whittle down the board's complexity to a manageable one for players. 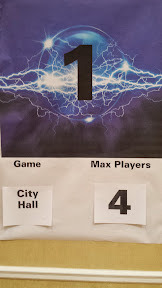 At this convention I got to play City Hall once and Captains of Industry twice. This was the first time I'd personally played either in over a year. It was also the first time I've ever played them purely for fun, not worried about testing for changes or marketing for a crowdfunding project. It was a blast. This is going to sound stupid and self-serving, but I'd forgotten how much fun these games could be. Speaking of which, Seth Jaffee sent me the printer proof copy of City Hall. It's gorgeous to look at. So shiny! Then TMG announced that they're splitting the shipments of the two games. Unfortunately, it means Captains of Industry won't arrive until November. 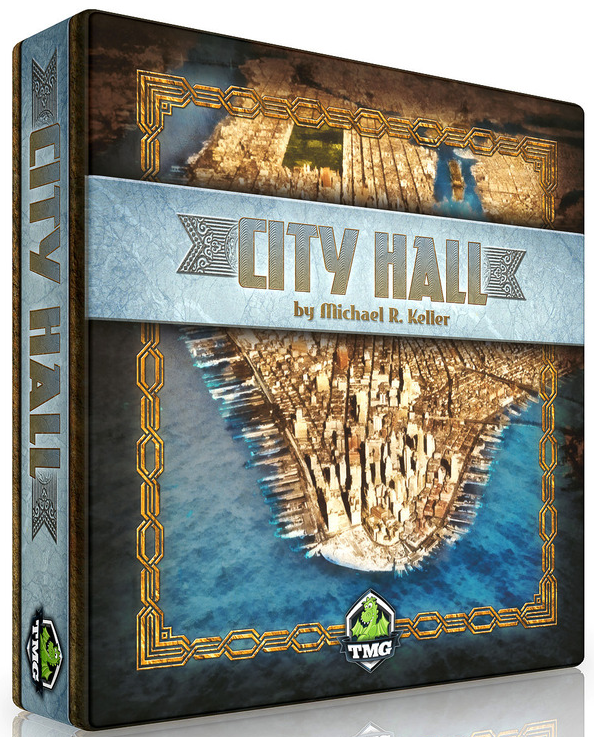 However, City Hall should arrive in time for DexCon. I've contacted the organizers to see if I can sponsor prizes for a debut tournament there to celebrate my very first published game. July can't come fast enough! 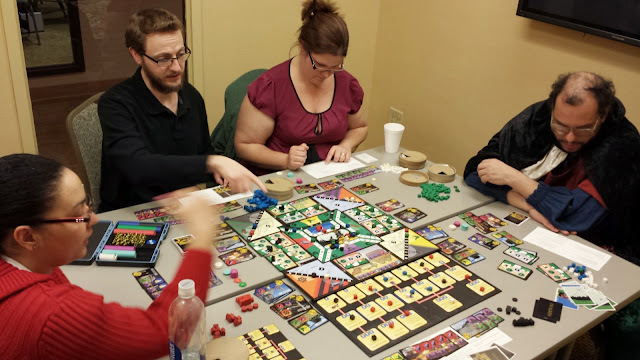 I closed out the month with a visit to the NYC Games Forum's April Playtest Night. It was very much like Unpub, except squeezed into a single evening and with and 80:20 videogame-to-boardgame ratio. I will definitely attend future ones, though I would like to bring a game that requires less than four players to start. Overall, April was quite productive. The next two months I am going to try to slow down somewhat. July will mark the beginning of my promotional tour with DexCon, then GenCon in August, then Metatopia and BGGCon in November. I would like to find something in September or October, but I might be too tired post-GenCon. I'm no spring chicken, which you can tell because I use phrases like "spring chicken".